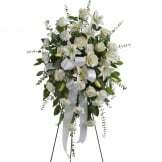 This standing spray, in elegant white and soothing greens, will serve as a beautiful tribute to someone who brought love and peace to those around them. 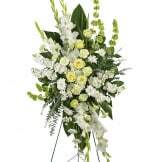 • This all white floral spray includes roses, Asiatic lilies, carnations, and is accented with assorted greenery. 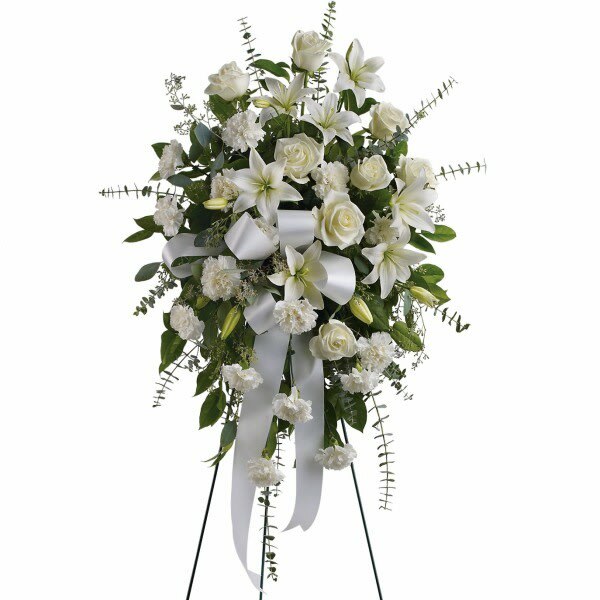 • Measures approximately 25" W X 35 1/2 " H.
Flowers will be received by a Salser & Dillard Funeral Chapel's staff. The arrangement was beautifully done and delivered on time. Handled very professionally during our family's sensitive time. Top Notch customer service! 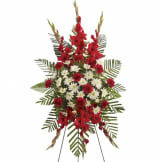 During a time of sadness, it's comforting to have a professional florist fulfill our floral needs. Thank you! While I didn't see the flowers my friend said they were beautiful and a very nice arrangement. Ordering was very smooth. Very pleased. Heard nothing but positive comments about the arrangement. We appreciated being able to do this from Alaska with such ease. The flowers were delivered on time and were much appreciated. Thank you. The floral spray was just beautiful. Very pretty flowers at a really good price. The arrangement was beautiful & delivered promptly. A beautiful spray of flowers. Delivered on time and in very fresh condition. Thanks! Ordered flowers in the morning and they were delivered early afternoon. They even hand wrote the card based on what my typed message was. I thought that was nice. The flowers were identical to the flowers on the website I chose. This is rare and I was so thrilled when I saw them in person myself. I highly recommend them based on my internet experience. I ordered these on a Sunday for a Monday delivery. The flowers were delivered before the services and were just as pictured and absolutely fresh and beautiful. I was very pleased with my selection and in using this site. I would definitely use it again. Flowers were fresh and beautiful. I would definitely order again. Funeral home employees were professional and helpful. Place was 5 star. Although I was not there to see the spray, the family has told me that it was the most beautiful one there. Thank you so much for taking care of my request so promptly and with such quality. When ordering over the internet,you never know what you are going to get, but I am most pleased. This was just as pictured. Full and beautiful! Thank you for calling to let me know you did not have enough white flowers and could you use yellow, which I agreeded to. The flowers were beautiful and I found out later from family that yellow was her favorite color. So happy it worked out like it did. Very Pleased!!! We would like to thank you for your kind and prompt service ,for delivering the Sentiments of Serenity Spray flowers that we ordered for Nieves Reyes . 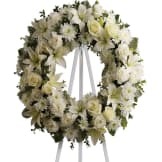 One of the member of our family attended the Wake and funeral, and we were told the flowers were really nice as what it is in the picture We give your service a 5 rating, again thanks for your kind help ...Jesus. Exactly what the picture looks like. Beautiful! The flowers were fresh and amazing. They were even more beautiful than the photo shows. I could not have been more pleased. Thank you so much for the fantastic job! I was not able to go to the funeral since I live in Virginia and have an elderly mother to take care of. My cousin told me the flowers were so nice and pretty. So I am pleased with your service. I know my uncle would be pleased. The spray we ordered was delivered on time and was beautiful, the flowers were fresh and and the arrangement was elegant. The flowers were beautiful. A little pricy however ordering was very quick and easy. Will use again if need arises. This floral arrangement was a good value for the money. It was a lovely tribute to the life we lost. Looked just as pictured. Thank you for creating such a beautiful flower arrangement. Very happy with the service received. Notifications of delivery were most helpful. Just loved the arrangement. Everyone remarked about it. Thank you for being to create the unique notation of "Queen Victoria" and for the new and less cumbersome sash reflecting the message. What a beautiful job. Thank you so very much. It was nice that such a sad time was made a little better due to the wonderful arrangement. Many thanks! We Thank you for the Sentiments of Serenity Spray prepared for our Nephew. A relative called to Thank us and tell us that the flowers were beautiful. We felt very happy about that since this was the first time we ordered without seeing what we were getting. THANKS again, God Bless, Happy Customer! Delivered as promised. Flowers were fresh. The eucalyptus sprays were a very nice addition. The floral arrangement was beautiful. Very pleasant customer service! Easy ordering and the flowers were absolutely beautiful and fresh. Arrived before time promised. I highly recommend and will definitely use in the future! 5 stars! I was unable to attend the service, so did not get to see the spray in person. However, I was told by others who attended that the spray was beautiful. Thank you for your excellent service. Quite honestly at such a stressful time, your company made it so easy. At first I was skeptical to order on line, but they were beautiful and exactly as pictured. They were a fitting tribute to my father. Very nice. Would have been helpful if the total costs (less tax) was known up front. We live in Florida and our Uncle's funeral was in Louisiana. We were not able to attend his funeral, however, the family told us the Sentiments of Serenity Spray was absolutely beautiful. This was most beautiful flower you all did.so proud of it.would order from you again.it was amazing. The flowers were very beautiful. Ordering them from this website was extremely easy. Would definitely use again! My flowers that I ordered were beautiful. Thank you. They were beautiful, the family loved them. This arrangement really stood out and I received great feedback on its great presentation! It is a great product. Looks amazing and very suitable for the occasion. This arrangement was larger than I thought it would be. It was so beautiful and looked wonderful in the room. The flowers were very fresh and the added personalization of the ribbon was the perfect touch. All of our flowers are designed and delivered by hand from a local florist in in Visalia.